The term ‘massage’ can be misleading. Some think of a massage as something to help you relax and wind down from a stressful week. If you search some of the discount websites online, there’s a good chance that some massage provider is offering a special. While there is nothing wrong with getting a massage purely for pleasure, our team at Caron Chiropractic Clinic believe there is a lot more that can be accomplished from massage therapy. If you are in the St Paul or Highland Park, MN area and are seeking natural pain relief from an injury or condition, let our massage therapy staff help supplement your other pain relief regimen with chiropractic care. ● Deep Tissue Massage – This may not feel as comfortable as some of the more relaxing options, but our deep tissue massages are fabulous at relieving pain, pressure and stress away from the problem areas of your body that you are dealing with. This type of massage has worked well with patients struggling from joint pain, stiff muscles, and even arthritis. ● Sports Massage – Sports are extremely popular around the St Paul & Highland Park areas. In turn, sports injuries commonly occur. Rather than relying on pain medication for relief, consider investing in a sports massage from our expert staff. This type of therapy can provide pain relief, strengthen your body and may even prevent future sports injuries from occurring. ● Prenatal Massage – Pregnancies can cause mothers to feel extremely uncomfortable. For mothers in their 2nd or 3rd trimester, a prenatal massage may be just what your body needs to relax and calm the discomfort that you are experiencing. Not only can this type of massage provide pain relief for expectant mothers, but it can also help improve circulation during the pregnancy as well. If you are struggling with managing pain or are dealing with an ongoing injury that is holding you back from being 100%, it may be time to consider a holistic and natural pain relief option. 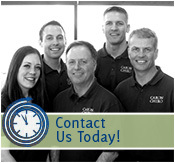 Serving St Paul & Highland Park, MN with experienced massage therapy services, it is time for you to visit Caron Chiropractic Clinic. Give our massage therapists near you a call today at (651) 255-9999 to set up your first appointment with our dedicated staff. This entry was posted	on Friday, April 28th, 2017 at 3:14 pm	and is filed under Auto Injuries, Chiropractic, Chiropractic Treatments, Chiropractor, Massage Therapy, Whiplash. You can follow any responses to this entry through the RSS 2.0 feed. You can leave a response, or trackback from your own site.